Imagine riding a motorcycle that’s almost impossible to fall off, or watching a world champion racer eat the dust of an android rider tearing up the track at 200kph. Advances in self-drive tech have so far been the domain of cars, but now their two-wheeled counterparts are coming up on the outside – and fast. 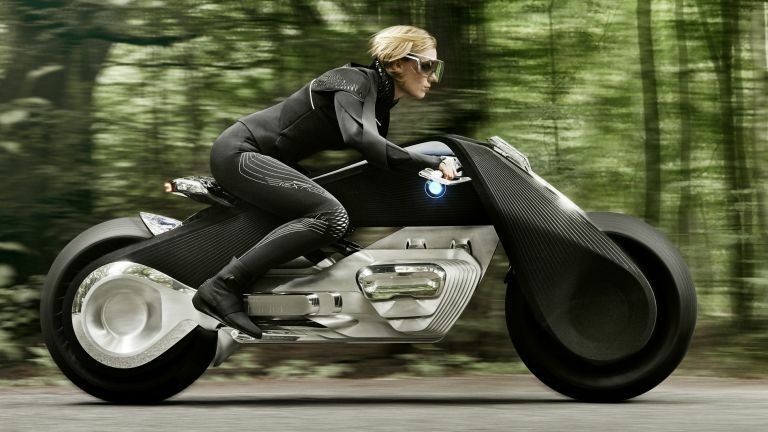 Earlier this year Honda unveiled its self-stabilizing concept motorbike. It features a computer that automatically takes control when the bike drops below 3mph. When it senses the bike leaning, the computer separates the handlebars from the forks and swings the wheels in the opposite direction, adjusting the angles of the front forks and lowering the bike’s centre of gravity. When the rider recovers their balance, the handlebars and forks lock back into place so the rider can retake control and carry on their journey. “In slow riding scenarios where riders have to make fine steering adjustments constantly to trickle through traffic, it would be a great help particularly for shorter riders, who don’t have such easy ground reach, in scenarios where they are having to paddle the bike though tight spaces.” So says Paul Nowers, Motorcycle PR Manager for Honda Europe. Although motorcyclists make up just 1% of total road traffic, they account for 19% of all road deaths, with riders 38 times more likely to die than drivers. And although the Honda is still in the prototype stage, the company claims the technology has the potential to cut road deaths. Japanese rival Yamaha is taking the idea of automation one step further with Motobot. This isn’t a self-driving motorcycle, but a standard 1000-cc R1M bike with one crucial difference - it has a robot rider. Designed to look just like a human rider - complete with helmet and visor - its hands turn the throttle, grab the brake and operate the clutch, and its feet shift the gears. This year its speed is expected to double to 200kph, with the ultimate aim of it taking on – and beating – the legendary nine-time Grand Prix Motorcycle racing champion Valentino Rossi. But if riding rather than watching robots have all the fun is more your bag, then the day could soon come when you can hit the open road without the need for any protective gear or even a helmet. Looking like something out of Tron, BMW’s Motorrad Vision Next 100 concept bike is all about safety. It features auto-balancing technology similar to the Honda and can stay upright even when standing still. BMW says it will also feature a visor that provides all-round vision and heads up display, as well as an artificial intelligence ‘digital companion’ that can provide assistance to riders when needed. But legendary seven times World Superbikes champion Carl Fogarty MBE told T3.com that although he welcomes advances that make riding safer, he was against fully-autonomous technology. “Foggy” has thrown his backing behind ZONA, a camera that can be fitted to the rear of a motorbike, with the video feed being piped through directly to a display inside the helmet visor. He said: “Any technology that helps a new rider to balance and gain confidence has to be welcomed, as long as they are able to switch it off when they’re comfortable.